The Magnalight BL70-LED Magnetic Mount Blasting Light from Larson Electronics' uses LED technology and heavy duty materials and design to provide operators with an LED blasting light that can provide illumination while resisting the damaging effects of operation in media blasting applications. This LED blasting light produces 6,020 lumens and comes with an inline transformer that allows operation with standard 120V-277V AC current. These units can also run on 9 to 46 Volts DC without the transformer, allowing operators to connect the unit to vehicles and equipment for added versatility. A magnetic mounting base provides easy placement of the light on any metallic surface that will accept a magnet. The BL70-LED Blasting Light produces an intense light beam that provides effective illumination during blasting operations involving sand, water, and other media where the ambient atmosphere is often contaminated with dust and debris. 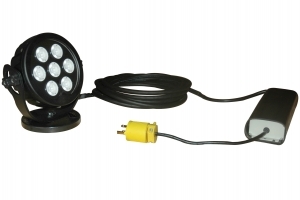 This IP68 rated LED blasting light is waterproof to three meters and produces 6,020 lumens using seven 10 watt Cree LEDs. Designed with an extruded aluminum housing that resists damage from exposure to sand, water, dust and high vibratory conditions, this unit is siitable for use in abusive environments. Available peel off Mylar lens protectors add further durability and provide the impact resistant polycarbonate lens with additional protection against scratching and damage. A single 200 lbs grip magnetic mount base provides versatile mounting options and will hold the light firmly in place, even under high vibratory conditions. An adjustable trunnion bracket allows the light to be repositioned vertically for optimal light beam placement. This units' construction consists of extruded aluminum housing, polycarbonate lens, stainless steel hardware, and a durable black finish that provides protection against corrosion. This portable blasting light operates natively on 9 to 42 volt DC current for easy connection to vehicles and equipment, and includes an inline transformer that allows operation on any standard 120 to 277 Volt AC current. Optional light beam types include a 20 degree spot beam configuration for precise light control, and 40 degree flood configuration for illuminating larger areas. Included with this blasting light is 50 feet of SOOW cord to give users ample length for connecting to power sources outside of the work area. The 10 watt Cree LEDs in this unit are rated at 50,000 hours of use, providing years of reliable operation, and the IP68 rating allows users to simply hose the unit down after use, even with high pressure spray, without worrying about internal water contamination.